Shakespeare’s wondrous comedy that celebrates the power of love tells the story of Rosalind, Shakespeare’s most irresistible heroine. Exiled from court, she escapes with her cousin into the wild forest of Arden and, disguised as a boy, creates a world of her own. But will her encounters with the lovestruck Orlando complicate this new life? Will love find its way? 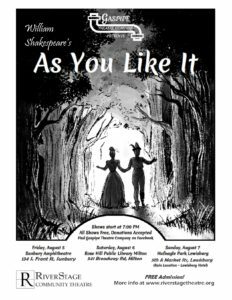 Come find out in this FREE outdoor production of one of Shakespeare’s greatest plays! This Gaspipe production features an all-star cast of local Shakespearean actors including Isaac Conner, Colby Bastian, Bernadette Haas Jones, Justin Moore, Ben Hartman, Andrew Shaffer, Nick Buckman, Pete Zerbe, Joe Frangione, Caroline Pogust, Kelly Oberlin, Sasha Ernest, Nickolette Jones, Michael McJunkin, Tom Egan, Davena Crispell, Derek Scott, Maggie Able and Gary Jones. Don’t miss it!